Fracking has dramatically increased the demand for water in the nation’s most productive oil field, Texas’ Permian Basin. Water usage has already risen sixfold since 2011, and according to research firm IHS Markit, demand will double again by the end of this year. The market for water is booming, but many in West Texas worry about the depletion of groundwater. But there are new market developments that could meet the demand for frack water and mitigate environmental concerns at the same time. It takes an average of 500,000 barrels of water to frack a single oil well, according to Joshua Adler, the Founder and CEO of a startup called Sourcewater, an online marketplace for frack water. “We’re a marketplace for water logistics, so it’s kind of like Expedia,” explains Adler. By the “old way of doing things,” Adler means direct negotiations between oil and gas companies and ranchers, like Schuyler White. “All the ranchers out here sell water if the oil companies come in and start drilling,” says White. It’s windy and overcast, but serene nonetheless. Longhorn cattle graze in the distance, and birds swoop down across the surface of the water. “Most of the public doesn’t realize how precarious our water situation is out here,” says White. “They seem to think that they can keep pumping the water until there’s not anymore left, but the reality is that I think we’re a lot closer to running out of water than what people think. But White’s concern for groundwater is no match for the incentive to sell it. 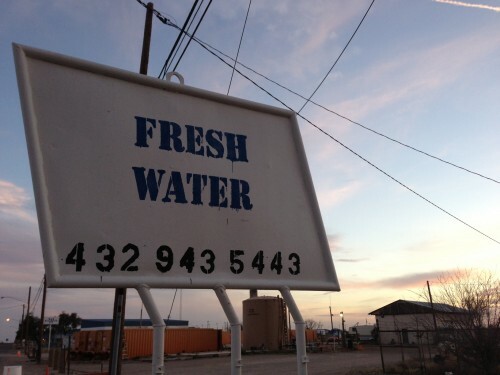 He’s sold water from other properties and says he’ll probably sell water from this spring as oil and gas companies expand south from the heart of the Permian Basin into other parts of West Texas. “They’re gonna get their water somewhere, and in this business you can’t pass up a revenue stream because it’s so hard to make a living,” says White. Drought and consolidation have made traditional ranching activities like raising cattle increasingly difficult for small producers, and groundwater has the potential to bring in millions of dollars. Recycling produced water is attractive to oil and gas companies, but it comes with its own set of environmental concerns, namely groundwater contamination. Still, Texas regulators see it as an elegant market solution to growing concerns over groundwater supplies. The state started allowing recycling and transfer of produced water without a permit in April of 2013. “Produced water, which has traditionally just been a waste stream turns into something more like a commodity that you can use for energy instead of fresh water,” says Adler. Whether it’s produced water or water from the same aquifers the public relies on, Sourcewater is part of a young industry that’s poised for tremendous growth. Bluefield Research estimates a total of $136 billion dollars will be spent on supply, transport, storage, treatment and disposal of water over the next ten years. Almost 40% of that spending will come from the Permian Basin. This entry was posted in KRTS News, KXWT News and tagged aquifer, Groundwater, Sourcewater, Water. Bookmark the permalink.